BOCA CHICA, Dominican Republic, October 7, 2018 – Second-seeded Sam Pedlow and Sam Schachter of Canada defeated top-seeded compatriots Ben Saxton and Grant O’Gorman to reach the men’s finals of the Boca Chica Beach Volleyball Tournament to be contested on Sunday evening. Pedlow and Schachter needed 38 minutes to defeat Saxton/O’Gorman 2-0 (21-19, 21-18). 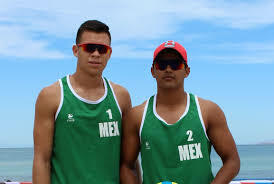 The other semifinal match saw Josue Gaxiola and José Rubio of Mexico winning 2-0 (21-18, 21-14) against William Allen and Ryan Doherty of United States to earn the spot in the gold medal contest. The men’s final match will be contested at 19:00 with the bronze medal match between Saxton/O’Gorman and Gaxiola/Rubio scheduled at 17:00. In the match for fifth place, Cubans Karell Peña and Luis Enrique Reyes will face Guatemala’s Andy Leonardo and Luis García. Peña/Reyes beat Erick Zaun and Avery Drost of United States 2-0 (21-10, 23-21) while Leonardo/García won 2-0 (21-13, 21-15) over Rubén Mora and Dany López of Costa Rica.